Amy Wiggs, who played Baritone for the Capital Regiment in 2003 and 2004, sent in this one. 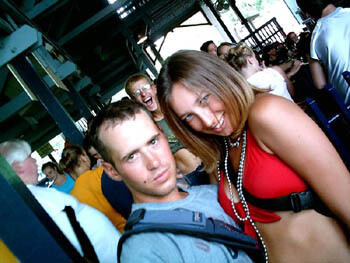 "This is a picture of Michael Hyndman (aka Cleveland) and I at King's Island during our one real free day of the summer. Michael came to Capital Regiment at the beginning of the summer from Revolution along with three others. The Revolution marchers and I became great friends over the summer. I had a great time marching baritone with Cleveland, he was always doing something crazy."